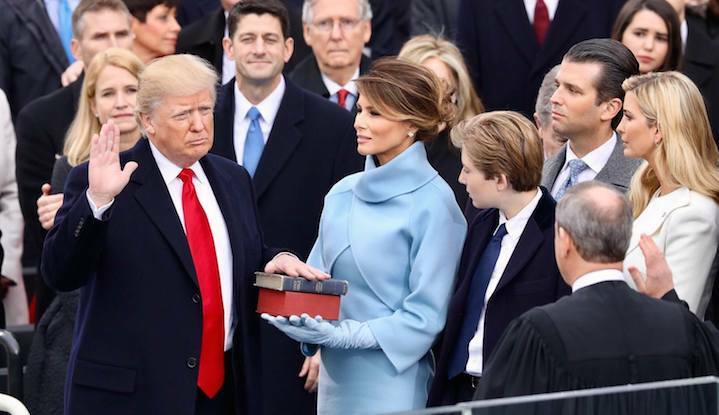 Donald Trump is sworn in as President on January 20, 2017. A conservative lawyer who advises President Donald Trump on judicial nominations appears to be linked to an anonymous limited liability company that donated $1 million to the Trump inaugural committee, according to campaign finance records. In December 2016, the Trump committee received a seven-figure check from BH Group, LLC. Journalists have tried for the past year to locate anyone who works for the company. The limited liability company only lists a paralegal at Holtzman Vogel, a conservative law firm, as its organizer in Virginia incorporation records. A recent New Jersey congressional campaign filing may have helped unravel the mystery. The report lists Leonard Leo, an executive vice president at the Federalist Society, the conservative lawyers network, as an attorney for BH Group. Leo has served as an adviser to Trump on judicial nominations, and he helped lead Supreme Court Justice Neil Gorsuch through his Senate confirmation process last year. Leo and the White House did not respond to questions from MapLight about his role with BH Group. Holtzman Vogel did not respond to MapLight’s request for comment. The campaign report, filed by Jay Webber’s congressional campaign, was first highlighted by journalist Wendy Siegelman. Leo has been identified as the president of the BH Fund, a nonprofit that was given influence over hiring and admissions at George Mason University's law school as part of an anonymous $20 million donation. The only previous public reference to BH Group was in a tax return filed last year by the Wellspring Committee, a secretive conservative nonprofit. The dark money organization reported paying $750,000 to BH Group in 2016 for public relations. Wellspring served as the primary financier of the Judicial Crisis Network (JCN), another dark money organization. The network spent $7 million on advertisements to persuade Republicans to block President Barack Obama’s 2016 Supreme Court pick, Merrick Garland. JCN then spent $10 million to support Gorsuch’s confirmation last year. The network is currently pushing the Senate to confirm dozens of other Trump judicial nominees. According to the Daily Beast, Leo was instrumental in starting both JCN and Wellspring. The organizations provided almost 80 percent of the money raised by the Rule of Law Project, a conservative nonprofit that Leo helped lead. The Federalist Society, where Leo has worked since 1991, has members throughout the senior levels of the Trump administration. Its annual convention last year in Washington, D.C., featured speeches from Environmental Protection Agency Administrator Scott Pruitt, Attorney General Jeff Sessions, Labor Secretary Alexander Acosta, and White House Counsel Don McGahn. The Federalist Society’s top donors have included billionaire libertarian brothers Charles and David Koch; Koch Industries, their energy and chemical conglomerate; the Mercer Family Foundation, funded by hedge fund magnate Robert Mercer; and the U.S. Chamber of Commerce, the powerful business lobby. Leo appears to be especially close with Pruitt, who previously served as Oklahoma’s attorney general. Records from Pruitt’s Oklahoma office show he frequently spoke at the Federalist Society events, and the organization paid for Pruitt to fly from Tulsa to Washington, D.C., for only a few hours to meet with Leo in 2016. An unnamed EPA official recently told the New York Times that when Leo called his office “and asked for something, we did it, it doesn’t matter what it was." Agency records show Leo helped arrange Pruitt’s agenda during his trip to Rome last year. The Washington Post found that Leo originally paid for one of the administrator’s dinners before Pruitt reimbursed him.